Proprietor Barbara Banke (Jackson Family Estates) celebrates Maggy Hawk, a gifted thoroughbred racehorse, with the wines sourced from a 23.55-acre vineyard in the “deep end” of the Anderson Valley. 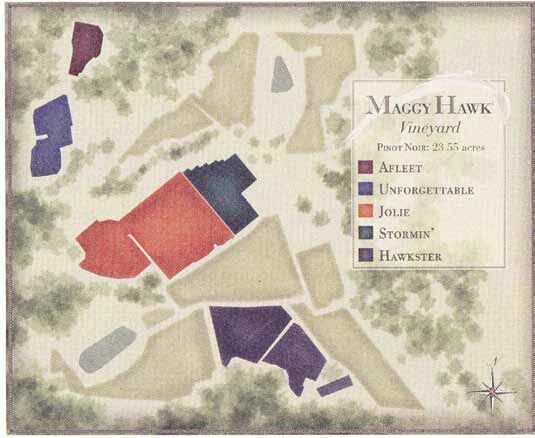 Each wine is named for a horse born to Maggy Hawk, Jolie, Afleet, Stormin’ and Unforgettable, and to her sire, Hawkster. Winegrower Dennis Winchester lives on the property and works with winemaker Elizabeth Grant-Douglas to produces these special wines. 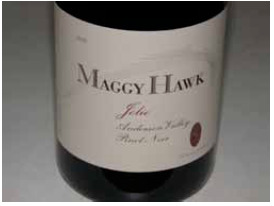 The Maggy Hawk label was launched with the 2007 vintage. The Maggy Hawk Vineyard contains a complex of different aspects (primarily south and southeast facing) and clones, producing an array of different Pinot Noirs. It is situated adjacent redwoods at 300 to 530 feet, and is one of the last vineyards in the Anderson Valley before the Pacific Ocean. The soils are decomposed sandstone which has exceptional drainage and low nutrients. Yields are painfully low, never above 2 tons per acre. The vineyard was planted in 2000 to clones 115, 667, Pommard 5 and Wädenswil. Jolie is from a southeast facing block planted to clone 115 and is always the most nuanced, floral and pretty wine. Afleet is from a 1.23-acre block of Pommard 5 clone and offers complexity, a mouth filling texture, and remarkable consistency. Stormin’ is from clone 667 and shows a powerful nature each year. Unforgettable, also clone 667, but planted on the vineyard’s steepest slope, is difficult to farm and pick, and incredibly low yielding. It is typically dark-fruited, intense and replete with minerality. Hawkster is only produced in the best vintages from Wädenswil clone and is the crown jewel of the Maggy Hawk Collection. I have previously reviewed the 2007 and 2009 vintage wines. They are something special. The wines are sold only through an allocated mailing list at www.maggyhawk.com. Domaine Anderson officially opened during this year’s Anderson Valley Pinot Noir Festival. The winery is the vision of the Rouzaud family of Louis Roederer and their American team dedicated to producing still Pinot Noir and Chardonnay wines. Roederer Estate, which also owns Schraffenberger Cellars, has been in the Anderson Valley for 30 years. Sourced from 52 acres of estate vineyards, the inaugural 2012 vintage of Domaine Anderson produced two estate Pinot Noir and Chardonnay wines from a blend of several vineyards. In addition, two single vineyard Pinot Noir and Chardonnay wines were produced in limited quantities sourced from small, selected blocks in Roederer’s Anderson Valley vineyards. The winery is located south of Roederer Estate Winery in Philo across the street from Goldeneye and adjacent Balo Vineyards. It is surrounded by the 17-acre Dach Vineyard. Domaine Anderson’s winemaker is Jerry Murray, who has dedicated his career to producing super premium Pinot Noir wines. Spanning three continents and eight wineries, Murray acquired his skills working in Oregon, New Zealand and Germany. The winemaker consultant is Jeremy Seysses of Domaine Dujac. The winery will not be open to the public, but the wines are available through a mailing list at www.domaineanderson.com. The wines are released twice a year to the mailing list.